With Mortal Kombat X heading into the rear-view mirror, it’s about time for NetherRealm Studios to announce a new game. 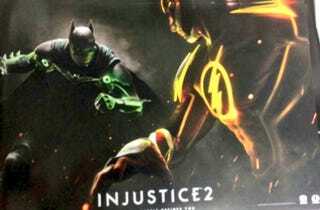 It looks like that game is Injustice 2, a sequel to the DC fighting game from 2013. The first word on Injustice 2 came from Twitter this morning, apparently part of a retail promotion arriving before the game’s official reveal. Game Informer and Polygon both received similar shots from sources, and Kotaku has separately confirmed the poster is real with a retail source. Mortal Kombat co-creator and NetherRealm founder Ed Boon, known to be playful and teasing on social media, is taking the news in stride. Hopefully, we’ll get a look at the game in the coming days.